Oven-cooked ratatouille is one of summer's simplest suppers. Try this version which uses butternut squash. Ideal for vegetarians. Preheat the oven to 200ºC, gas mark 6. Place all the ingredients, except the garlic and cheese slices, in a large, deep roasting tin. Roast in the oven for about 40 minutes or until the vegetables are beginning to soften and turn golden brown. Stir occasionally as they cook. While the vegetables are cooking, place 3 garlic and cheese slices in a food processor or blender and pulse into rough breadcrumbs. When the vegetables are ready, remove from the oven and season with freshly ground black pepper. Sprinkle the crumbs over the ratatouille and return to the oven for a further 15 minutes or until the crumbs are golden and crispy. Meanwhile, cook the remaining garlic and cheese slices according to pack instructions. 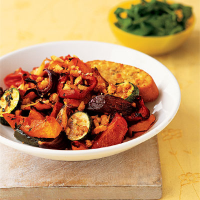 Serve with the ratatouille and a bag of Waitrose Salad with Watercress Spinach and Rocket. All the ingredients can be chopped and mixed together the day before. Cover with clingfilm and keep in the fridge until ready to cook. The ratatouille also freezes well. Cook the vegetables and season as above. Freeze in a suitable container. Thaw overnight in the fridge, then sprinkle with the crumbs and cook as above.